Soy milk is a versatile dairy milk alternative that is both convenient and nutritious. 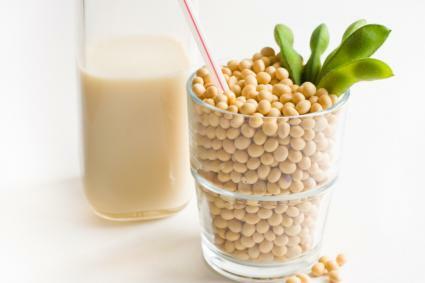 Whereas at one time soy milk was regarded as a specialist food and only available from health food stores, it is now widely available in both liquid and powdered form. Even with all the other non-dairy milk alternatives on the market, soy milk still stands out for its many benefits. Despite its name, soy milk is not a milk at all. It is a liquid that comes from the process of mashing up and pulverizing cooked soy beans. This releases important nutrients that are suspended within the liquid. There are several key benefits of soy milk, which can be attractive to different people. Soy milk comes from the soybean and is created without the use of any dairy products. This means that soy milk is perfect for vegans. Vegans can use soy milk as a substitute for dairy milk in cooking as well as enjoy soy milk in hot and cold drinks or on its own. Soy milk is perfect for people with an intolerance or allergy to dairy products, such as those who have a lactose intolerance. People who find dairy products difficult to digest often find that soy milk is a great substitute. Unlike milk from cows which can be relatively high in cholesterol, soy milk contains no cholesterol. This makes soy milk a useful alternative for people on low cholesterol diets. In fact, in addition to containing no cholesterol, soy milk may actually help to raise your good cholesterol levels, while lowering the bad. This make soy milk additionally beneficial for those who need to watch their cholesterol levels. Soy milk is a useful source of fiber. While dairy milk contains no fiber, soy milk contains up to two grams per serving. Fiber is important to aid digestion and can be lacking in some diets. Soy milk contains important nutrients such as protein. It also contains isoflavones, which are reported to help prevent heart disease, some types of cancer and osteoporosis. Soy is also a good source of vitamins, such as vitamins B and E.
Soy milk, like all soy products, contains the phytonutrients genestein and phytoestrogen as well as isoflavones. All of these phytonutrients have been found to have cancer fighting properties. These phytonutrients are seen only in non-fermented soy products, like soy milk. There are many different types of soy milk available, including low- and no-fat options. There are also an increasing number of soy milk drinks available. These are often a mix of soy milk with other ingredients, such as fruit juice or other sweeteners, and this can make a healthy alternative to other convenience drinks. When people look at the benefits of soy milk, one that is often overlooked is its convenience. Soy milk is often available dried and in powdered form, which makes it a highly convenient store cupboard ingredient. Dried soy milk has a long shelf life and can be used to make just the amount of milk required. This makes it a convenient and economical way to buy soy milk. You can use soy milk in many ways. It makes a good alternative to dairy milk in most recipes. It should be noted that soy milk has a distinctive taste and may alter the finished flavor of some recipes. The taste, however, is not unpleasant, and many people feel that it enhances the dishes where it is used. Soy milk is also the foundation of tofu. Dried soy milk is easy to reconstitute and can also be used to create a successful alternative to dairy cream. This is simply achieved by using less water when reconstituting the dried soy milk powder. The benefits of soy milk make it an attractive option for many people. Anyone who is interested in a healthy and convenient foodstuff should consider trying soy milk. This versatile product is for everybody and not just vegans or those with a dairy or lactose intolerance.